Text & Photographs By Stan Richard © All rights reserved. Although I enjoy landscape photography very much, my main passion is in capturing what I and many others consider nature's greatest show - the Aurora Borealis, or "northern lights". If you live in the southern hemisphere they are named the "Aurora Australis" or "southern lights". Today we know what causes this phenomena to occur, but many times I have thought about how mankind long ago reacted to what must have been something very mysterious and magical in the night sky. Photographing the aurora has been going on for quite a few years, but because of modern technology and scientists being able to forecast somewhat reliably when there will be a geomagnetic storm, capturing the aurora has become a little easier as we can now be prepared. Notice I state "a little easier" as capturing the northern lights is still a challenge. Patience, vigilance and a little luck are still required if you want to view or capture this magnificent phenomena with your camera. You have to be in the right place at the right time and have your equipment ready. There have been many times when the forecast looked good and I headed out to dark skies in the middle of the night and saw nothing. That can be very disappointing. So the next time you get an alert you're not as likely to get out of bed and then you miss the show. If you stay vigilant and keep going when conditions are good for aurora, you will eventually be rewarded with a light show that will have you standing there looking at the sky with your jaw dropped! The grand display that occurred during the early morning hours of May 15th, 2005 was one such show. 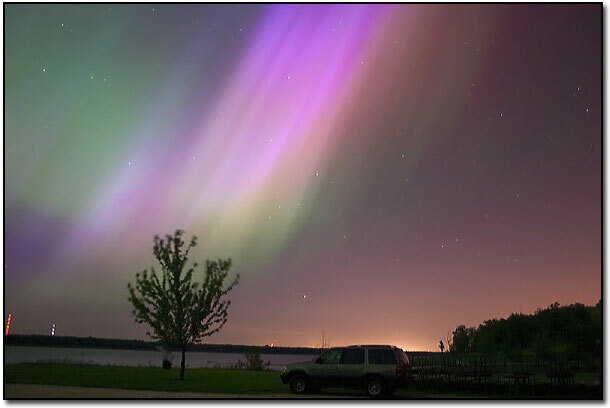 May 15, 2005 - Aurora Borealis over Saylorville Lake north of Des Moines, Iowa. For staying on top of the "geomagnetic" or spaceweather conditions, I use the *free* SMS text messaging alerts to my cell phone that is provided in the Aurora Monitor software sold by the Solar Terrestrial Dispatch at www.spacew.com. For a very reasonable price of $75.00 USD for the software, you can set up the text messaging service to send you alerts to your cellphone for whatever parameters you would like. Of course you need to have a cell phone that will receive text messages, most do these days. Check with your service provider. If you're a newbie, the folks at STD are more than happy to help get you started. There is also a forum at the website where many aurora enthusiasts gather and share information. Spaceweather.com also has a similar service available. Of course if you live at a latitude that is too far south, you're never going to see the "lights" no matter what you do. I live at 41.3 N latitude but my "geomagnetic" latitude is 52. This is because the earth's "magnetic" north pole is located south of the actual north pole, towards the North American continent. The northern lights follow the "magnetic" north pole making it better for us folks in the US to view them. How lucky we are! I consider my latitude almost the southern borderline for viewing the aurora with any regularity. I usually get to view them at least a couple times per year and once in a great while we will get to see a great show. Of course, the 11-year sunspot cycle influences the geomagnetic activity. If you would like to find your geomagnetic latitude, Click here..
Capturing the aurora on film or digitally really isn't that difficult, once you're there and the lights are out. If it's cold out, you need to dress properly. I try to "overdress" using 3-4 layers if needed. I can always remove an item of clothing if I'm too warm. What's most important is keeping your head, hands and feet warm. For gloves, I cut the ends off the thumb, index and middle finger of my righthand glove making it easier to operate my equipment. For capturing the lights, you do need a fairly fast wide-angle lens (35mm or wider) with an aperture of at least f/3.5 or faster, preferably f/2.8 or f/2.0. You need to have a camera that has the manual "bulb" setting for exposures and use fairly fast film such as ISO400 or 800. I have also used ISO200 and "pushed" it when developing. I now shoot digital RAW, using ISO400 with my Canon 300D and find that there is little noise in the images if I keep the exposures below 25-30 secs. If it's cold out, the noise is even less as the CMOS sensor stays cooler. The advantage of shooting RAW is that I can shoot exposures of less than 15 secs if the aurora is fairly bright and then "push" the exposure in the raw conversion software without adding a lot of noise and maintain the detail and definition of the aurora in my images. You will also need a good sturdy tripod and I highly recommend a shutter release cable. A note about finding infinity focus in the dark, if you know your lens well or have infinity focus marked, great! If you're out where there are no lights and you can't achieve infinity focus or want to be sure, try turning on your vehicle's parking lights, then walk about a hundred feet away and focus on the lights, this should achieve infinity focus. I use this technique when needed. Now, you've gotten the cell phone alerts in the middle of the night and gotten up, got dressed, have your equipment ready, driven to dark skies and you are now ready to shoot some northern lights so you might as well try and get the best compositions that you can. If you have a lake nearby, go to the southern shore and try and get the aurora reflecting in the water, or you can nicely frame your composition with some trees. Don't be afraid to experiment by shooting portrait mode, or try a panorama. It helps to know the location you'll be shooting at so I would advise visiting during the daytime and checking it out. And if you can get them out of bed too, bring a friend along as it's really nice to have company when watching the lights. It's also safer too. They'll thank you later for waking them up! And lastly, don't forget that cellphone. It will keep you up-to-date on current conditions while you're out there in the dark and will get you help if something happens. I hope you have similar success as I have in capturing what I and many others consider nature's greatest show - the Aurora Borealis, or "northern lights".